Make sure your replacement doors are installed properly with Feldco. Your door installation in Chicago will be done by some of the industry’s best installers. We make sure that everything goes smoothly from your first meeting with the product specialist through to the end of the installation. It’s very important that your door is properly measured otherwise you won’t have the right sized door to fit your existing door opening. We make sure you don’t suffer through this problem. During your initial meeting with a product specialist, they’ll measure your door opening. A few days later, we’ll send a measure technician to measure the door opening one more time. This guarantees we have the right measurements before the installers come to your house. When they do come, you know they’ll have the correct door size and everything will fit well. When your door is installed properly, it does more than make your entryway look good. Your replacement door will also improve your entire home’s energy efficiency. This is because it fits correctly and there are no gaps between your replacement door and the door frame. That means no drafts will be able to get into your home and heat or air (depending on the season) is trapped inside. There are two benefits to having an energy efficient door – your home will be comfortable year round and you’ll save money on your energy bills. Since heat or air is trapped in your home, you won’t have to endure the outside weather. This is important with Chicago’s extreme temperatures. With a properly installed door, your air conditioner and furnace don’t have to work as hard to reach your desired temperature. Since less power is being used, you’ll save money on your energy bills. Over time, your door installation in Chicago pays for itself. With Feldco, you know your door will be installed properly. The door installers are factory trained and certified meaning they’re the best of the best. 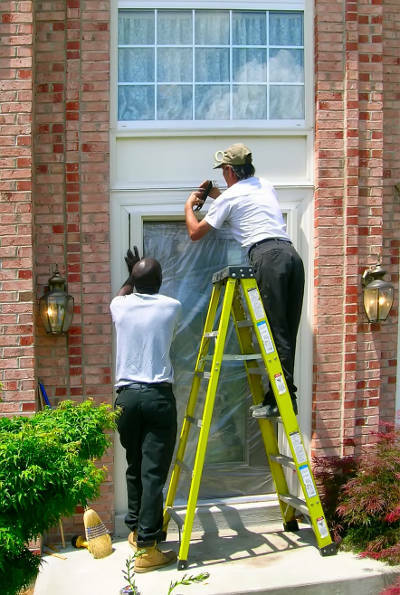 They’ll quickly and efficiently install your replacement door and, when they’re done, they’ll leave your home looking better than when they got there. It’s important to get replacement door installation in Chicago from a company you can trust. Without proper installation you won’t enjoy the beautiful looks or energy efficiency of your new door. Make sure you get the best door installation in Chicago from Feldco. We’ve served over 350,000 homeowners in the Midwest over the last 40 years. We have more experience than most other door companies in Chicago. Get a free quote now and see what the fuss is about. You won’t be disappointed!